While I may not have quite the clout (yet?) to call myself a television expert, I do fancy myself a bit of an amateur connoisseur of all things televisual, not to mention that I have a long-standing vested interest in the relationship between feminism and television production and the role of women in television history. So you can imagine my surprise, a distinctly pleasant surprise, when I learned about the pioneering foremother of all television personalities, star of the first real TV family sitcom, by way of Aviva Kempner's compelling, well-executed documentary, Yoo-Hoo, Mrs. Goldberg, which opens tomorrow in New York City. 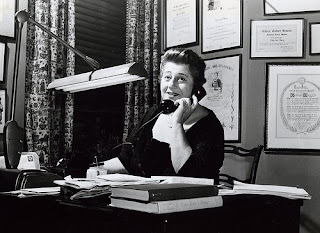 Chronicling the life and times of the eminent screenwriter/actress/producer Gertrude Berg (born Tillie Edelstein in 1898), Kempner's documentary skillfully weaves together archival footage from the 1930s, 40s, and 50s with contemporary interviews with Berg's co-stars, family, and fans, including Supreme Court Justice Ruth Bader Ginsburg and NPR correspondent Susan Stamberg. And, the best part? Kempner includes excerpts of audio from Berg's well-loved radio show, The Goldbergs, which launched her writing and acting career when it aired in 1929, as well as rare footage from the CBS television show which followed in 1949. The television version of The Goldbergs, a situation comedy about a middle class Jewish family, earned Berg the first Best Actress Emmy in history and a tremendous fan following. But Yoo-Hoo, Mrs. Goldberg isn't only an enjoyable, edifying journey, showcasing the charming personality and extraordinary work of a television legend. Masquerading beneath the pleasingly nostalgic facade of a well-paced and fun documentary, the film also performs a great public service. A rich historical tapestry is interwoven into the narrative of Berg's life, the effects of the World Wars and, most significantly, the Red Scare and House on Un-American Activities' blacklist rendered starkly against the backdrop of Berg's ostensibly-carefree family comedy. Moreover, Gertrude Berg is, or at least should be, a feminist icon to be lauded and remembered, not locked away in the vault of television gone by. It's a terrible shame that I, a great lover of television, had never heard of Berg until now, but it's not surprising. The laws of popular culture unfortunately dictate that the new not only supersedes but often tramples on the old. Feminism, too, wave after wave, is occasionally guilty of reinventing a perfectly good wheel. 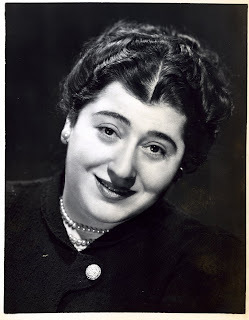 Sometimes its important to be reminded of those that came before, and Gertrude Berg is nothing if not an example of an exceptional feminist, a pioneer of radio and television, a woman ahead of her time, a woman who fashioned an incredible career and whose worked touched millions. The least we can do is remember her, and Kempner's lovely documentary doesn't let us forget. Yoo-Hoo, Mrs. Goldberg opens Friday, July 10th (tomorrow!) in New York City at Lincoln Plaza Cinema (1888 Broadway) and The Quad (34 West 13th Street), followed by screenings throughout New York State. LA-area screenings begin July 24th, with a nationwide roll-out throughout the late summer and fall. For a full (and continually-updated) list of screenings, check out the official website. Yoo-Hoo, Mrs. Goldberg Trailer from Aviva Kempner on Vimeo.